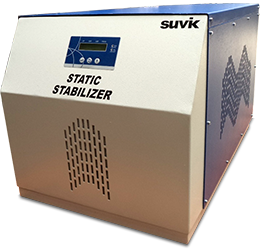 Suvik is engaged in designing and developing systems related to state of art technologies to broaden its product offering to existing customer base as well as a large number of potential customers. The in-house R&D recognition certificate from Department of Scientific & Industrial Research (DSIR), GOI Ministry of Science & Technology, India; allows Suvik to find new business partnerships, enhance Suvik brand and gain a reputation as an innovative business. It helps Suvik to reduce cost to stay competitive till offer the state of art tomorrow’s technology today. Accreditation Certificate for quality management system. The quality management system meets the requirements specified in the international standard for quality management systems ISO 9001:2008. There are no exclusions from the quality obligations stated in this standard. The scope covers design, manufacture, marketing, installation and servicing of Suvik products. This certification demonstrates Suvik’s ability to consistently provide product that meets customer and applicable statutory and regulatory requirements. In turn it aims to enhance customer satisfaction through the effective application of the system including processes for continual improvement of the system. The displayed certificate of compliance of one of the products of Suvik i.e. UPS to its published brochure specification by accreditation body Electronics & Quality Development Centre (EQDC) India. This testimonial is a proof of product qualification that the certified product has passed performance and qualification requirements stipulated in Suvik product brochures. Such certificates of products will give confidence to customers to establish suitability for a specified purpose. Hence, such product certification scheme ends at providing third party guarantee of quality, safety and reliability of products to the ultimate customer. It’s a standard mark on a product of an assurance of conformity to the specifications. Dust & Water has been greatest enemies of power electronics with regard to industrial applications. Hence, compliance to international protection also known as Ingress Protection i.e. IP code in context to qualification standard IEC 60947 allows customers to have peace of mind with respect to environmental protection. ERDA i.e. Electrical Research & Development Association a national accredited test laboratory certifies conformity for Suvik product enclosures.